Ferrari had speed, home field advantage and the front row of the grid all in its corner for the Italian Grand Prix at the Autodromo Nazionale Monza. But Sebastian Vettel spun out of contention on the first lap. Kimi Raikkonen then led the race in the other Ferrari. But the Silver Arrows Mercedes team set a trap for Raikkonen that resulted in Lewis Hamilton winning on Ferrari's home turf. Here is how that victory unfolded. Raikkonen earned the pole after turning the fastest ever lap at Monza. Vettel missed out on the pole. While Ferrari had the front row locked in, Vettel would be at a slight disadvantage in the run down to the first chicane just after the start of the 53-lap race. Hamilton and Mercedes teammate Valtteri Bottas filled the second row. Row 3 consisted of Max Verstappen (Red Bull) and Romain Grosjean (Haas). When the red lights went out to start the race, Raikkonen got in front while Hamilton and Vettel contested second place. Vettel and Hamilton clashed in the first chicane but both kept going. The duo clashed again at the second chicane. Bits of bodywork flew. Vettel spun. Hamilton kept going. "That was silly, where did he want to go?" Vettel radioed. "It was a racing maneuver," Hamilton said. "It's what we're supposed to do out there. We're supposed to be racing. I left him space. And it's never a great feeling when you spin and you're facing the other cars coming the other way. And then you get back up and you start from the back and you have to come through." Vettel had to pit for a new wing and he got a set of the soft compound Pirelli slicks while he was there. He was also near the back of the pack with lots of work to do. The stewards ruled that neither driver was at fault and it was a racing incident. While Vettel was out of contention for the win, the avid tifosi were still happy that the other Ferrari was leading the race ahead of Hamilton's Mercedes. The top 10 drivers had started on Pirelli's super soft compound slicks. Raikkonen pitted at the end of lap 20 for a set of the soft compound tires. "It's hammer time, Lewis," his engineer radioed. The plan was for Hamilton to turn some fast laps so that after his pit stop he could come out ahead of Raikkonen. Hamilton did not pit immediately. "He stayed out, Kimi, we need to push," Raikkonen's engineer instructed. Raikkonen pushed very hard and that took a lot of life out of his new tires. Meanwhile, Bottas, who had been third had yet to pit and now led. Mercedes set its trap. "Keep Kimi behind you," Bottas was told. 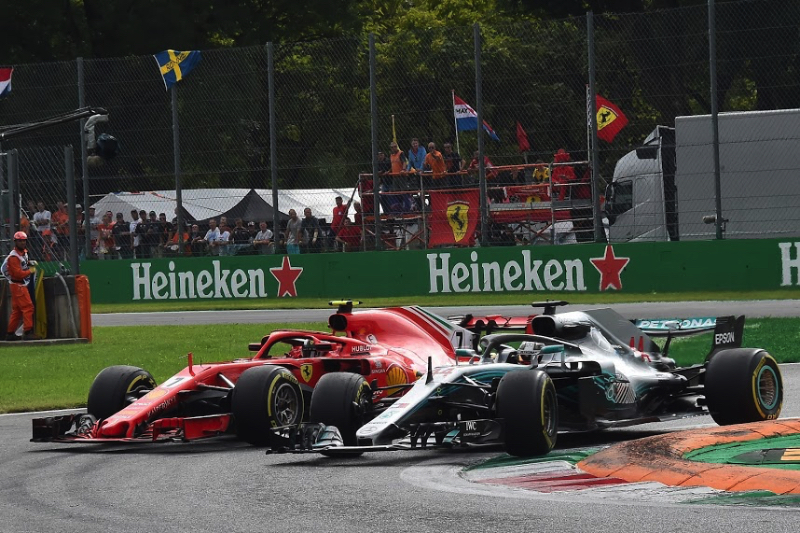 The plan was to slow Raikkonen down, without deliberately blocking him, so that Hamilton could come out in front after his own stop for the soft Pirellis. Hamilton pitted at the end of lap 28, eight laps after Raikkonen, and he emerged behind Raikkonen. Thanks to Mercedes' trap, Hamilton was able to close in on Raikkonen. Raikkonen's hard laps on his new tires left the left rear blistered. After Bottas finally pitted, Hamilton was 0.8 of a second behind Raikkonen and on fresher tires. Finally, on lap 45, Hamilton passed Raikkonen in the first chance to take the lead in the Italian Grand Prix. "I think it was quick enough," Raikkonen said of his Ferrari. "But unfortunately, our rear tires went and it was a losing battle since that point. I tried but it was impossible in the end unfortunately. It's far from ideal but this is what we got today and we did our maximum." Despite Ferrari's advantage at home, Hamilton went on to win the Italian Grand Prix for the fifth time, which ties the record number of victories set by Michael Schumacher. Raikkonen's second place meant that he was on the podium for the 100th time in his career. Meanwhile Bottas and Verstappen were battling for third place. "I was really trying to do everything I could to get to the podium," Bottas said. "First, my mission was to try to hold up Kimi for a while, but then I was trying to end up on the podium. It was hard racing, sometimes not quite as fair as I was hoping for, so he (Verstappen) got a penalty so then I'm on the podium." Officials gave Verstappen a five second penalty for blocking Bottas. The peeved Verstappen kept his foot on the gas and crossed the finish line in third place. But after the penalty he was classed fifth behind Bottas and Vettel. The tifosi, of course, were unhappy that Ferrari had not won. And they booed Hamilton on the podium. "There was a lot of negativity, as there is when you're against an opposing team," Hamilton said. "I could see so many British flags out there, they know who they are. I was pointing them out and they inspired me so much for this race and that's what I was driving for. In future, the negativity is really a positive thing for me because I harness it and turn it from negative to positive." The end result of the Italian Grand Prix was that Hamilton gained 13 points on Vettel and now leads him by 30 points with seven races to go.